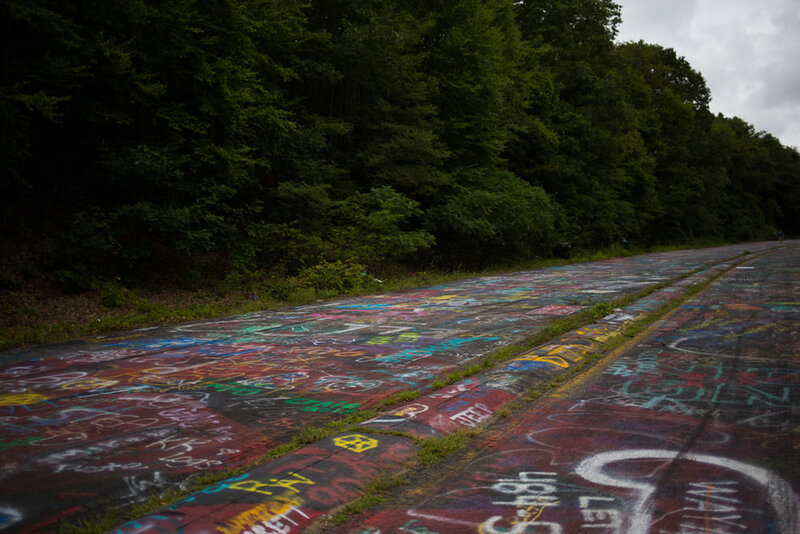 Centralia, located in Columbia County, Pennsylvania, became a virtual ghost town due to a coal mine fire that has been burning underneath the town since 1962. 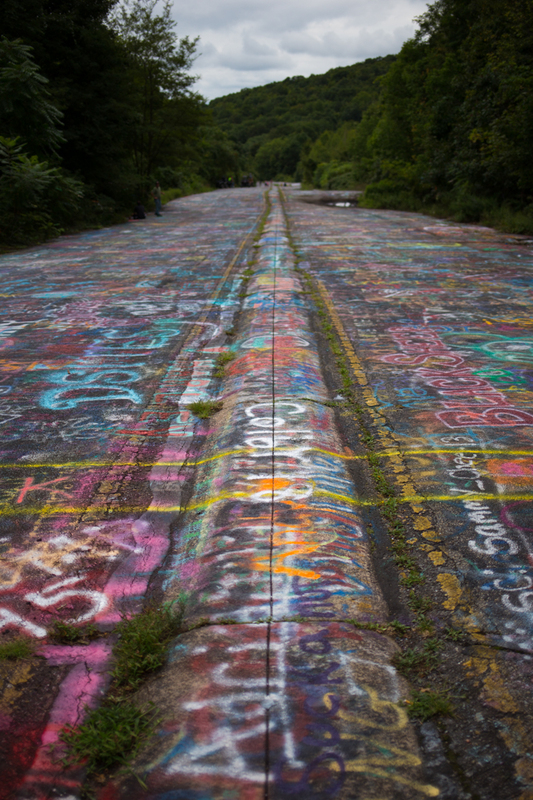 It is the least-populated municipality in Pennsylvania and in 2013 Centralia had just seven permanent residents. The USPS discontinued Centralia’s ZIP code in 2002 and in 2013 an agreement was reached with the seven remaining residents allowing them continue living in Centralia, with the stipulation that after they die the rights to their houses would transfer to the state. The first mines opened in Centralia in 1856, and the town’s population peaked in 1890. World War I and the stock market crash of 1929 contributed to a decline in coal production through to the 1960s. And in 1962, when a fire in the town landfill, located in an abandoned strip-mine, was not properly extinguished, it spread into a maze of abandoned mines beneath Centralia. I was told that warmth from the fire can still be felt today through cracks in the pavement, and I think I felt something, but it’s probably more pronounced in the colder months. In 1981, 12-year-old Centralia resident Todd Domboski fell into a sinkhole that appeared in his backyard. He was pulled out by his cousin, but it was discovered that the hot steam emanating from the hole contained a lethal level of carbon monoxide. 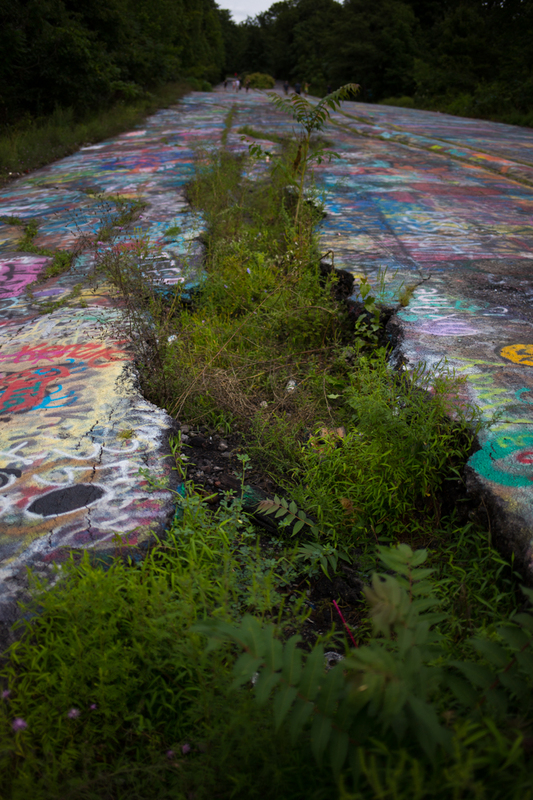 In 1983, the government provided more than $42 million to relocate Centralia’s remaining residents, with more than 1,000 people accepting the offer while 500 buildings were demolished. 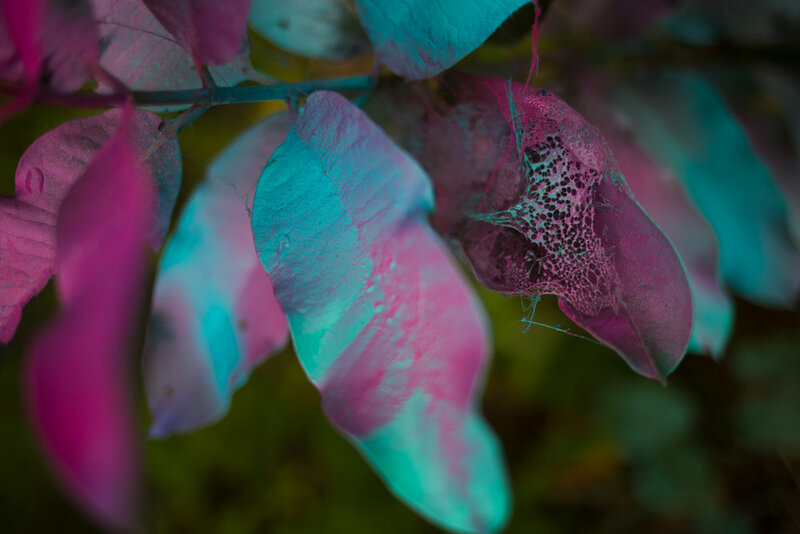 In 1992 all of the remaining property in Centralia was condemned and the fire spread beneath the nearby village of Byrnesville, which was also abandoned. A section of Route 61 was permanently closed in 1994 because of severe damage from the fire. 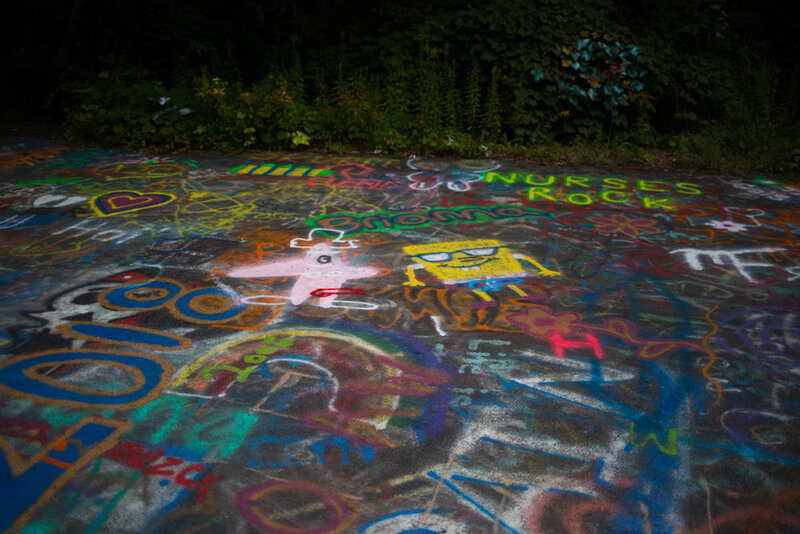 In 2018, the Pennsylvania Department of Transportation ruled that it could never be used again as a highway and turned ownership of the three-quarters of a mile stretch of road—now known as the Graffiti Highway—over to adjacent property owners. 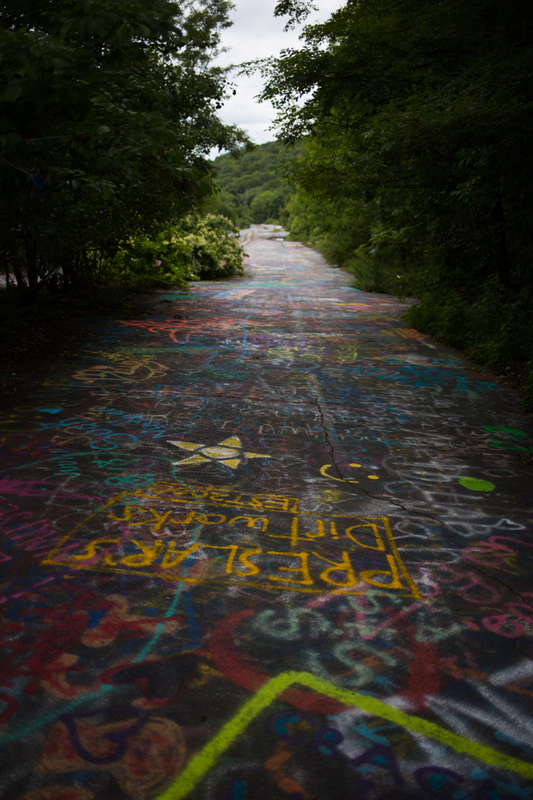 This change in ownership means state police are no longer issuing citations for trespassing, and word must have spread because on a Sunday afternoon the “abandoned” road was full of families adding their own spray-painted designs to the cracked and buckled pavement. While it wasn’t quite the desolate place that I was expecting—I could have done without the bros on four-wheelers—it was still a great place to get out of the car and stretch our legs amidst a colorful, post-apocalyptic backdrop.